Beam = 2.5m = 8ft 3"
This is meant to be a small comfortbale liveaboard boat. The size is optimised for the batchelor living the simple life on the water. Space has been provided for the neccessities, such as a sealed off bedroom with a double berth, with space for clothes and accessories, and space to stand up and get dressed in privacy if need be. In the main cabin there is a proper galley, with a sink, a stove and a bar fridge tucked away under the stern deck. There is 6ft 2 standing room throughout. The bow is of the scow type so as to reduce lenght overall, thus reducing marina fees and making road transport easier. Width is kept at the legal maximum of 2.5m to assist in road transport without complication. The shape of the hull and the ballast down low in terms of cheap concrete add stability. This gives the craft the means to survive rougher conditions that some craft, but it is not ocean capable. However it should be able to travel from one protected area to another within a given weather window. Effort has been made to reduce windage by means of sloping the topsides and curving the cabin sides, cabin top junction. 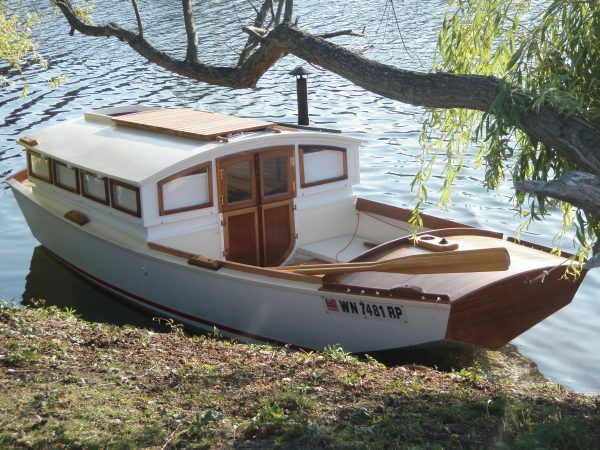 The flat bottom means that the craft can sit on tidal mud flats or sand banks with ease. The concept is that the craft would usually remain in the one place, but it has enough inherent seaworthiness to handle short coastal passages. Cost is reduced by using a simpe hullform and using moderate power. An inbuilt diesel of 25hp woul be the main driver with a small auxillary outboard of 15hp in case of emergencies. The two natural constructions options that come to mind are steel and wood. Perhaps a steel hull and wooden upperworks would be the ideal outcome. If trailering beam were not an issue, the natural beam of this craft would I think be a fraction greater, perhaps 9.5ft allowing for greater space and stability. Stability is something that feels right in terms of gut feeling, but should perhaps benefit from proper metacenter calculations. Also shown for comparison is the Joli boat. 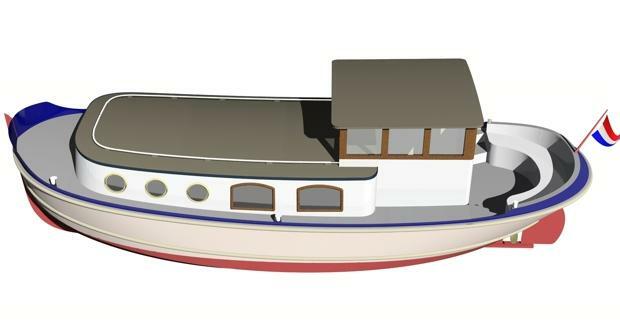 The Joli boat is lighter and simpler, but would be restriced to the areas it could traverse due to its flat bottom and low freeboard at the bow. Now the 2.5m beam allows for passage in protected conditions and allows for stress free trailering. The trouble is that I feel beam is a fraction too narrow for use in exposed areas. Now it is true that this is conjecture and not based on metacenter calcs. It could be argued that travel in exposed areas would be a relatively rare occurence, and preparation of a few hours work to achieve this could be justifed given the extra freedom of movement that such a change could bring. The solution I see is removable lightweight sponsons that increase beam without unduly raising the center of gravity. Such sponsons, similar to the conformal fuel tanks on some fighter jets would fit flush with the hull and have tapered ends so as to be less affected by waves. Diagrams below show how such a system might work. Another less refined craft, but something that can be made very quickly, in fact it is just a barge, are the triloboats as seen HERE. Many ideas are the same, the layout is similar, using logic. He has been able to use the greater beam to push the galley up forward and free up the aft part of the interior into one reasonably large open space. It is unsure from the picture if there has been space allocated for a shower, it could possibly be located near the head. His displacement of approx 5 tonnes sits well with my guestimate of 4 tonnes, for a craft that is a fraction shorter and a lot narrower. Based on sketches from his website, I made the following sketches. If the idea is to make the craft more 'liveaboard houseboat' like and less a true sailing craft, then the following changes could be made. We can omit the rig and leeboards for starters. The top structure could well be built lighter as it would not need to withstand the forces of rigging. We can add a chine to the hullshape, the chine not being needed to dig into the water to create lateral resistance when heeling. We can also lower the gunnel to improve accessability. We can raise the roofline a few inches to increase comfort, and without having to worry about the overturning forces of a large sail rig. The beam of 11ft will comfortably fit into most marina slips with little fuss. The broad rear and bow transoms would not produce a craft well suited for long ocean passages, however they give a lot of interior space for a 26ft craft. When introducing these changes we get something very practical. It could prove to be an excellent small liveaboard craft, without the expensive refinement of a sailing yacht or a classy motor yacht. The shape is simple and easy to make, be that in steel, wood, or even concrete. If built with steel hull, I think wooden topsides would be more practical. The scow layout reduces overall length for a given size, and thus reducing any marina fees which are based on length. 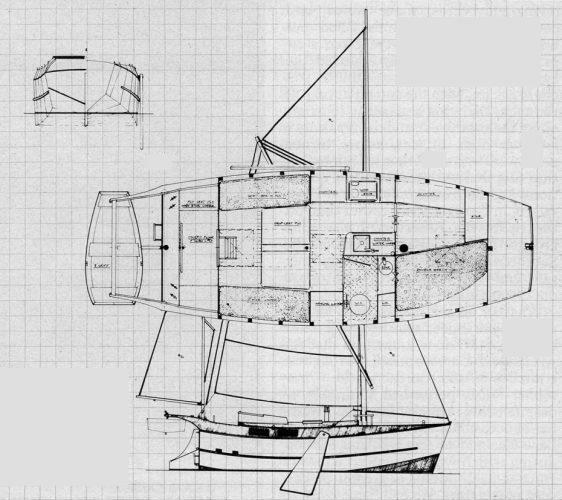 The blunt bow would be no fun going into a steep chop of moderate size, however the hullshape would comfortably cope with coastal passages, allowing for relocation of home base, when the time comes. Next a very slightly changed version with narrower transom and narrower bow transom. 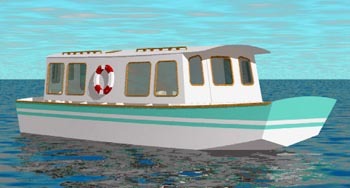 Not as good a cruising boat as a pure motor boat, but a simple easy to make houseboat, with ability to handle conditions a bit rougher than a typical houseboat. Note that under the floor there is space for gravel ballast, fresh water tanks and waste water tanks. Not a good a seaboat as a dutch barge, maybe a bit easier to make. Note that the extra space in the stern allows for an engine to be located (it has to go somewhere). Have also made the cabin roof curved as it is stonger and gives more interior space. Note that to get to the bow you have to walk above the roof, so a narrow walkway between front deck and aft deck via cabin top would be needed.